D'Antoni coached Los Angeles to a narrow victory that snapped Brooklyn's five-game winning streak. 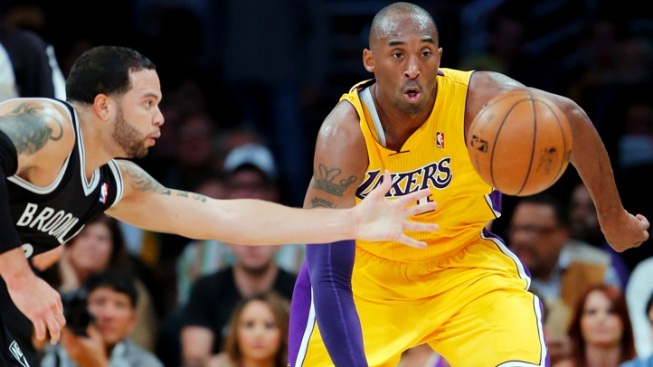 Los Angeles Lakers' Kobe Bryant, right, and Brooklyn Nets' Deron Williams go after a loose ball in the first half. obe Bryant scored six of his 25 points in the final two minutes, and the Los Angeles Lakers hung on for a 95-90 victory over the Brooklyn Nets on Tuesday night in coach Mike D'Antoni's sideline debut. Dwight Howard had 23 points and 15 rebounds despite a horrific 7-for-19 performance at the free-throw line for the Lakers, who have won five of six and moved above .500 since firing Mike Brown. Although D'Antoni is still unsteady on his surgically replaced knee, he coached Los Angeles to a narrow victory that snapped Brooklyn's five-game winning streak. Brook Lopez scored 23 points and Deron Williams had 22 for the Nets, who missed five of their last six shots in their ninth consecutive loss to the Lakers. Pau Gasol and Metta World Peace scored 17 points apiece as the Lakers wrapped up a tumultuous six-game homestand that began with coach Mike Brown's unexpected firing 11 days ago. The Lakers went 4-1 under interim coach Bernie Bickerstaff, but D'Antoni finally took over the bench nine days after he was hired. Los Angeles largely couldn't play at his favored tempo, but D'Antoni quickly learned the benefits of coaching Bryant, who took over in the final minutes. After taking a narrow lead through three quarters, the Lakers missed their first seven shots in the fourth and fell behind mostly due to their All-Star center's incompetence at the line. Brooklyn deliberately fouled Howard in the fourth quarter, when he went 3 for 10. Los Angeles still took the lead on Gasol's free throw with 2:37 to play, and Bryant hit a running hook shot after Joe Johnson airballed a jumper moments later. Johnson cut the lead to one point on a fast-break layup with 36 seconds left, but Bryant hit four free throws in the final 17.1 seconds while Williams missed a potential tying 3-pointer with 4 seconds left. Johnson scored 14 points for the Nets, who finish their three-game California road trip at Golden State on Wednesday night. D'Antoni nearly debuted on the Lakers' sideline two nights earlier against Houston, but was persuaded to delay by trainer Gary Vitti, who was concerned about the 61-year-old's mobility and late-game fatigue. D'Antoni felt much stronger after two more days of rest and room service at his hotel, and he eagerly got on the court without the aid of the crutches that kept him upright during his first practice last week. D'Antoni clearly isn't at full strength: He hobbled slowly on the sideline on the rare occasions he left his chair during play in the first half. He moved around with more vigor after halftime, protesting foul calls with his usual theatrical vehemence despite a slight limp in his step. Since D'Antoni took over practices last Thursday, the Lakers ran their last two opponents off the court with up-tempo offense in the first half. Los Angeles scored 40 points in the first quarter of a win over Houston on Sunday night, and Nets coach Avery Johnson claimed his team couldn't play at that pace — yet Brooklyn consistently got more fast-break production all night, outscoring the Lakers 26-7. After the Lakers scored the game's first 10 points against Brooklyn, Johnson's team got the game back to its preferred tempo. With Lopez and Williams breaking down their defenders for good shots in a half-court offense, the Nets led the Lakers 57-56 at halftime. Williams was particularly effective against Darius Morris, the third-string point guard thrust into a starting role with injuries to Steve Nash and Steve Blake. Williams employed his vicious crossover move multiple times, forcing Morris to commit three first-half fouls.